Please note: there are also detailed videos explaining all about this feature. You'll find them on the Cymatic YouTube channel by clicking the YouTube icon at the top of this page. The Football Odds Predictor feature calculates the expected 'true' odds for various types of football markets, based on statistics and mathematical formulae. We can then compare these predicted odds with the prevailing odds available on the Betfair markets, to look for trading opportunities. 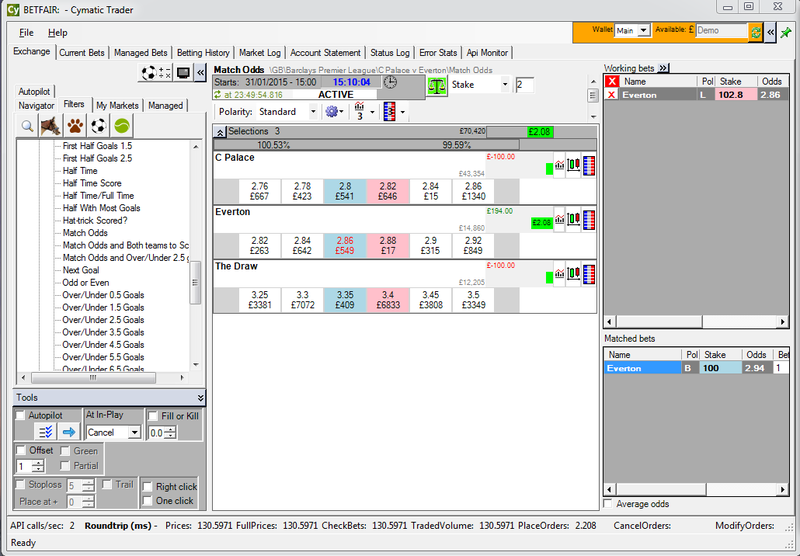 Trading opportunities may arise when the Betfair market odds are misaligned with the expected true odds. 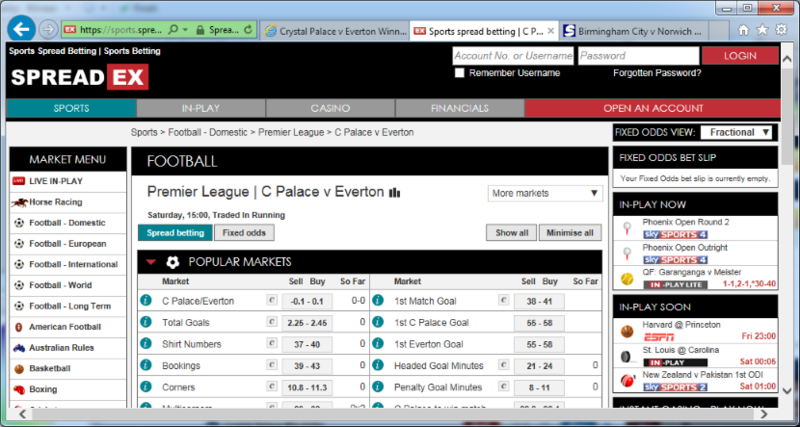 For example as shown in the pictures below, the Betfair odds for Everton were 2.94, but the expected odds were 2.85. So the Betfair odds were higher than the expected odds, causing us to consider backing on Betfair with the expectation that the Betfair odds might move down closer to the statistically expected odds. Once the Betfair odds have moved in the right direction and are closer to the statistically expected odds, we would take a profit by laying the outcome, for example at 2.86. Please note that the predicted odds are only relevant before the game starts, so please do not use this feature after the game has begun. The button shown above is located on the main Cymatic program window and opens the Football Odds Predictor. 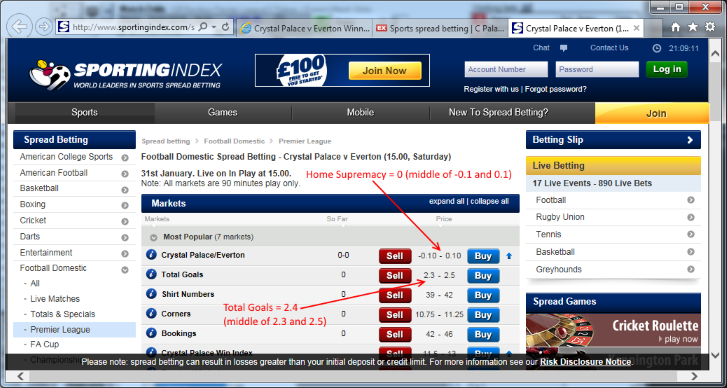 You only need to provide two input values into Football Odds Predictor, they are Total Goals and Home Supremacy. The Football Odds Predictor then calculates statistically 'true' prices for various markets such as Match Odds, Correct Score, Overs/Unders, Asian Handicaps etc. Some spread betting firms provide expected values for Total Goals and Home Supremacy and offer betting on these, so we can simply use mid prices from those published markets as our input values. Consider using their early prices for total goals and home supremacy as your input values, instead of prices too close to the start of the match. The early prices are calculated statistically and are therefore preferable to prices closer to the start of the match which sometimes get adjusted to also factor in the market forces and volatility. So the early prices could be regarded as the most 'true' statistical input values. 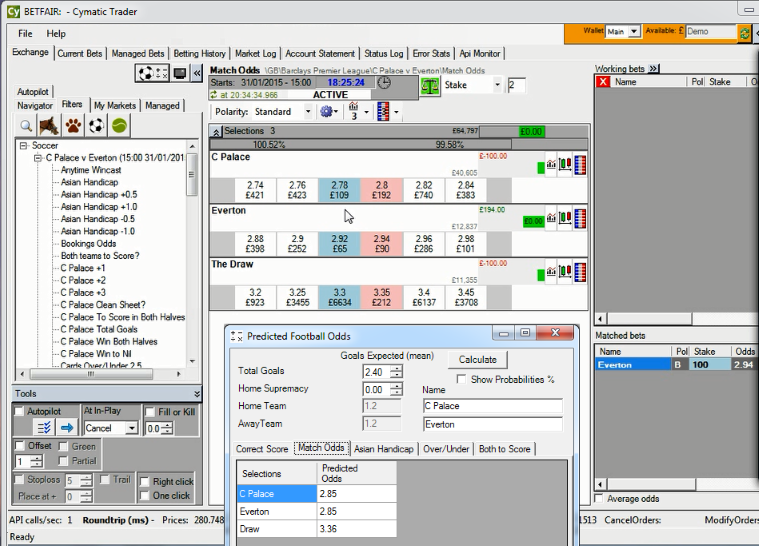 The Football Odds Predictor thus calculates statistically based prices for various markets, so that you can seek trading opportunities where prevailing market prices differ from the statistically calculated 'true' prices. Prices ought to move to align with the statistical prices more often than not. If they do not move to align, they could still be good value betting opportunities anyway. 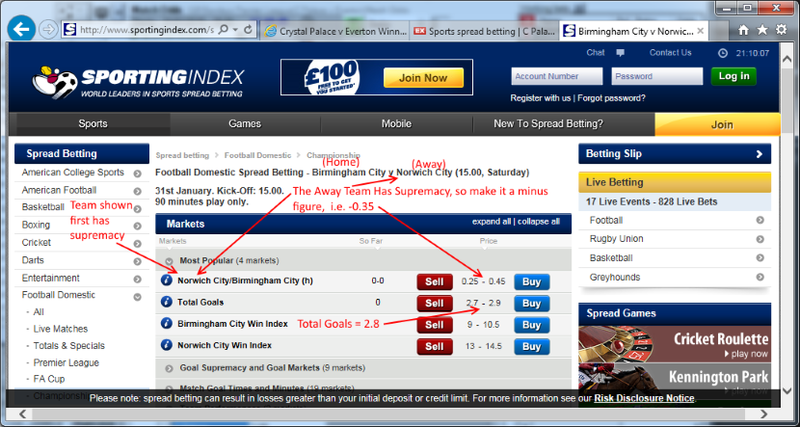 The picture below show a different market and explains what to do when the away team has the supremacy. Just make the supremacy value negative, i.e. 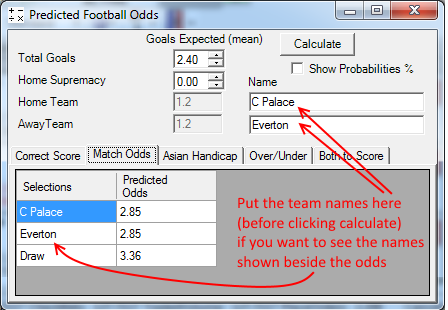 type it into the Football Odds Predictor as a minus value. 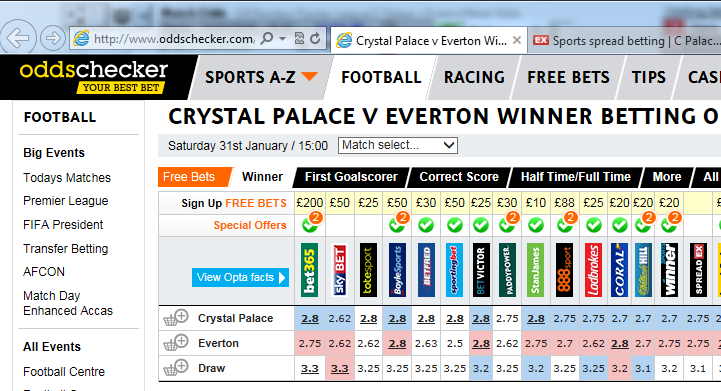 You should look to add weight to your analysis by also comparing the odds available at the bookmakers (oddschecker.com is good for this). In the examples mentioned, several bookmakers were offering odds of 2.8 for Crystal Palace which was similar to the Betfair price. This helped to convince us that the Betfair price was misaligned, because the bookmaker’s odds should usually be lower than the Betfair odds and the expected true odds (because of the bookmaker’s profit margin). When you find a good potential trade, you could post details of it into the special topic in the Cymatic forum. This would help each other to find more trades more quickly. As with any betting or trading activity, please use caution and remember never to risk more than you can afford to lose. Test strategies in demo mode before using real funds. Cymatic Ltd and its staff do not provide advice or accept liability for any losses arising from the use of the software.